Mika smiled and blushed slightly. She had never had much of an audience for her music. She caught some of the bouquets of roses and bowed again, her face flushed pink. "Ah it ended... That was great! Applaud! Encore!" Rei exclaims in his mind and Kurei chuckles, mused by Rei's excitement. 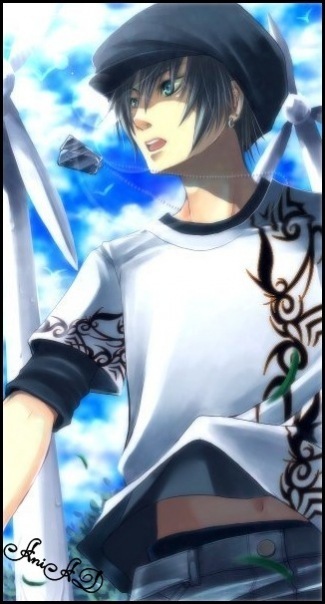 He spin around and float down, his blades disappear and his wings still in adult phoenix's size, so he didn't land yet, rather he just float above Mika and Yami and waved at them, he bow in air to Mika too, though he didn't have rose, nor did he not speak yet either. Mika blushed again, holding onto the roses she caught. She rested her violin at her side. "Thank you. I didn't know it would draw people, I just use it as an outlet. Its easier to express myself this way." Kurei smiles at her and tries to land, though he totally forgot about his big wings and he look at them nervously, where it decrease to normal size again. He smiles sheepishly as he land infront of Mika. "That was great, sis. Me and Rei like it, even my blades like it, they never done that!" he said. He waved to Yami. "Hi." you should perform in a theater or something...i can use my shadows as your back up "yami smiled" and what brings you and your ginormous wings around these parts "yami said to kurei"
Mika smiled. "I would like that someday. I really just like to play, it helps me think." Kurei scratch his head a bit. "Sorry about my wings, I not used to my true form yet. I'm Kurei Sikuro, a brother of Mika's. This is Rei!" He said as his right vampire eye' glowed dangerously and he grin at yami. "Nice to meet you, and lovely music, Miss Mika." said while looking at Mika too, his eyes stopped glowing as Kurei rolled his eyes. "Yeah yeah, go back in there, Rei. I just looking around here for a good spot to sleep peacefully since I haven't slept for awhile...You?" He ask yami. She smiled at Rei's complement, but her smile faltered slightly at Yami's question. "What am I thinking about?" She asked repeating the question. "I was actually playing this time not to think. I've been avoiding thinking about some things recently." Mika laughed lightly, "I used to do nothing but think, well and play my violin. So now to keep my thoughts quelled somewhat, I end up doing something like winding up here playing my violin. It keeps me from dwelling on the past....too much at least." oh thats cool "yami did a hand stand and walked around the rock"
Mika laughed at the boys light hearted antics. She sat down on the rock and opened a shadow portal returning her violin to its keeping place. Kurei scratch his head and look up in the sky. "Well guess I should be going. Takes cares, Mika." He said, taking off in airs and flies toward where Kyo's mansions reside.